Looking for a fast way to refresh and extend your volume? This dry shampoo, containing a blend of orange citrus and grape extract, immediately refreshes and bodifies lifeless locks, instantly creating volume you can see and feel. Just spray into flat hair and comb or brush through to absorb oil and instantly eliminate weight and refresh your volume anytime, day or night. Orange Citrus and Grape extract. 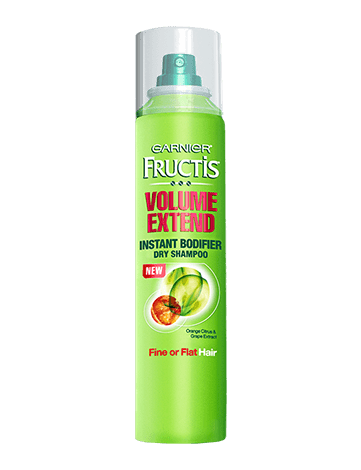 *Garnier Fructis Volume Extend system of Shampoo and Conditioner plus Dry Shampoo used later when needed to refresh hair over a 24 hour period. Shake well before use. Hold can 6-8 inches from head and spray evenly to dry hair. Comb through to remove. Works for all hair colors. Rated 5 out of 5 by AJ51 from The best dry shampoo Why was it discontinued? It was the best dry shampoo! I will not buy the replacement you offer! There is no comparison. Rated 5 out of 5 by Miracle1429 from Works on Fine Hair Please bring back the Volume Extend Line especially the Volume Instant Bodified Dry Shampoo. I have been looking for it for months and decided to get on your site to order it. I did not realize it was discontinued until I got on your site. I have used all the others suggestions and they do not work making my hair lay flat. This was the only one that worked that I could purchase in a store so that I was not always having to spend so much money in a beauty salon. Please reconsider bringing back a product the truly works for your customers. Thank you. Rated 5 out of 5 by KLH1991 from PLEASE BRING IT BACK This product was a life changer for me and I CANNOT find an alternative. Please bring it back or make another one!!!!!!!!!!!! Rated 5 out of 5 by MoBo from Great One! Why would you discontinue this??!!!! It was the best dry shampoo I ever tried! Rated 5 out of 5 by Careyite from Disappointed Please bring this back! This dry shampoo is the only one that works on my hair. I can't find anything else that I like. I'm really disappointed that this has been discontinued. Please bring it back! !